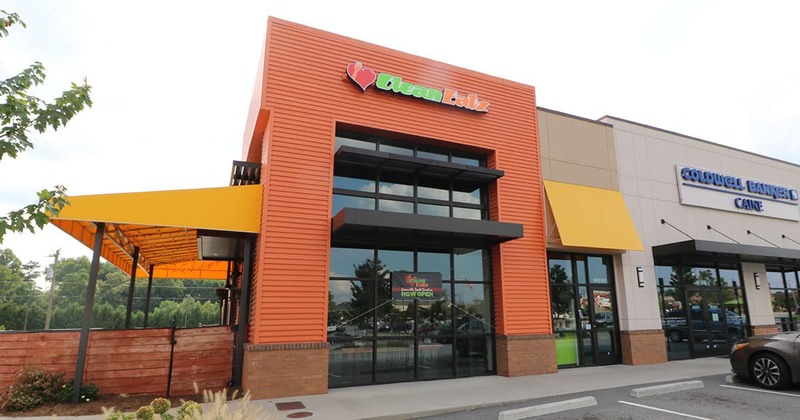 The old Local Taco location on Pelham road is now home to Clean Eatz, a restaurant focused on healthy food that also offers pre-made meals you can order ahead, take home and heat up, basically the same concept as Farm Fresh Fast that opened recently near downtown. Clean Eatz Started in wilmington, NC, expanding throughout the southeast to over 20 stores, with more coming soon. There’s been a huge surge in both healthy eating, and cooking at home, fueled by Blue Apron, Hello Fresh, Home Chef, Plated, amongst others. But unlike the online competitors that send you raw ingredients you have to cook, these meals come fully cooked and just need to be heated up. It works like this, you subscribe to a meal plan, purchasing meals in bulk. You go online, place your order by Sunday Night and Pick it up as early as the next day. Lindsey and I have subscribed to Farm Fresh Fast, and it was awesome not having put any thought or effort into dinner, saving us 30-45 minutes a night, if not more, stopping by the grocery store and cooking dinner. Clean Eatz offers 4 meal plans, and buying in bulk can save you big bucks. They also offer standard restaurant dining you can eat in or take to go, with a wide menu consisting of build your own bowls, build your own burgers, wraps, flatbreads, and even options for kids. If you live off pelham, it’s a great alternative to getting a quick healthy meal. If you live closer to downtown, we’d definitely recommend Farm Fresh Fast, which is not only focused on clean eating, but sourcing local ingredients from small farms.